Readers who enjoy similar titles such as Marissa Meyer's Lunar Chronicles, the "Empress of a Thousand Skies" duology by Rhoda Belleza, and works of Kristen Simmons will find this first installment an exciting reimagining of Les Miserables. A feel-good story with a few life lessons. A solid purchase for most middle school collections. A solid choice for contemporary romance collections in public and school libraries. A fun and light YA novel that will find a home in most collections serving teens. A solid purchase for secondary libraries; hand to readers looking for best-friend stories with a hint of romance. 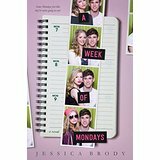 A teenage spin on Groundhog Day that is sure to please those looking for a light and entertaining read. A worthy addition with engaging, well-developed male characters grappling with classic coming-of-age issues.